DTDC’s eCommerce focussed section, DotZot is a dedicated service for eCommerce sellers like you. They offer numerous services like pay on delivery, express delivery, and next day delivery. With a vast reach to over 9900 pin codes, they are an experienced fleet who deliver products with ease! DotZot is a partner dedicated to eCommerce sellers. They have the latest trends combined with experience and fleet to provide your buyers with a pleasant shipping experience. In partnership with Shiprocket, you can utilize a multifunctional dashboard and also ship using 15 other courier partners. The best deal – you can choose a different one for each order. You can ship to over 26000 pin codes in India and reach the doorstep of each of your buyers. 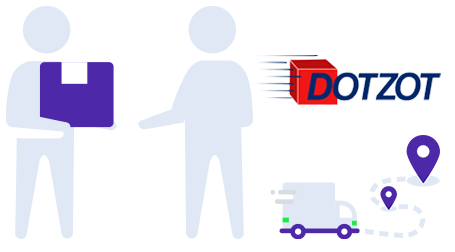 You can reduce the number of undelivered orders by making use of a automated NDR panel that can reduce return orders by over 5%! Provide your buyers with a customised tracking page that contains your company’s logo, links to other pages, banners, and your support details. Receive COD remittance thrice a week to keep the cash flow intact and improve sales every day. You Sign Up For Free! Shiprocket doesn’t charge any setup or monthly fee. You just need to pay for each shipment as you process them. Shiprocket is the best shipping and logistics platform with a user-friendly interface and helped me scale my business by lowering transit costs. We have been using Shiprocket as our primary 3PL logistics provider for fulfilling our amazon self-ship orders for over a year and the quality of their service is best-in-class.